The rates increases is set at 2.5%, a level that saw support from 57% of submitters. The targeted rate on accommodation was the most contentious and sucked up much of the media attention. It will raise $13.45 million and used to help fund half of the cost of tourism marketing and events by ATEED (Auckland Tourism, Events and Economic Development). The council say the money freed up from currently funding ATEED will create the capacity for an additional $100 million increase in capital spending on transport infrastructure, including helping to fund mass transit between the CBD and airport. Looking at the reports to the council, here are a few things that stood out not specifically mentioned in the press release. Auckland continues to face serious transport access issues involving the city centre, the inner suburbs, the Airport and the south. Auckland Transport is working to determine an effective public transport solution to this issue. Investigation and design of potential mass transit solutions continues and requires $10 million of increased operating budget in 2017/2018. Updated budgets for the City Rail Link have been provided with a total project cost of $3.4 billion and a 50/50 split between council and government. The overall impact of this update is an increase in the net capital investment by council of $240 million over the life of the project. With transport one of the key issues for Aucklanders, additional capital budget is proposed to accelerate programmes such as AMETI, the Manukau Interchange and public transport infrastructure, $30 million to support route protection for Mass Transit and timely property acquisition for future projects. An additional $161 million capital budget in 2017/2018 will be required. Following the Governing Body decision to proceed with Skypath, the inclusion of capital budgets is required for the landing on each side of the Harbour Bridge. This includes Harbour Bridge Park, moving the maintenance yard, and the northern landing pedestrian path. $7.2 million additional capital budget will be required in 2017/2018. Auckland needs an immediate berthing solution in order to accommodate larger cruise ships. It is therefore proposed that the council enables this by building a mooring structure, adjacent to the northern end of Queen’s Wharf, known as an the Inner Dolphin. This will require $10 million capital budget to be funded from existing Panuku budgets and recovered from cruise passenger levies over time. 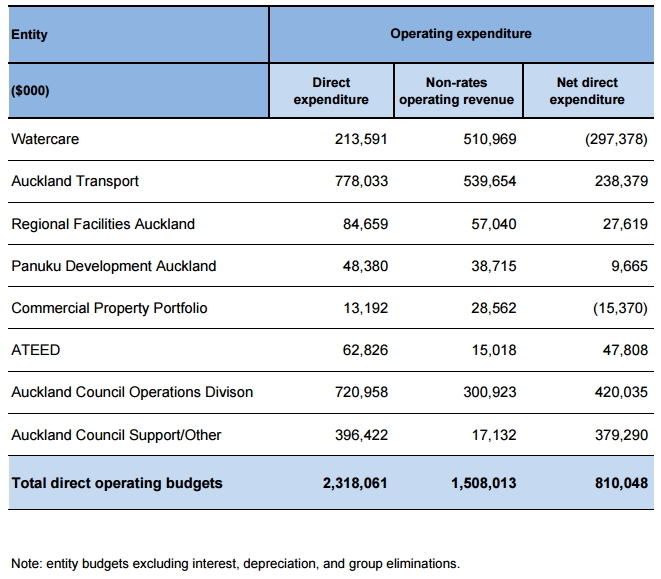 Of those, it would be good if the Council and/or Auckland Transport could break down what specifically is included in the extra $161 million to be spent. It seems really poor form for them not to do this. The most detailed the reports get on capital spending for transport is below. It suggests that Auckland Transport will spend over $800 million this year – although that will also include co-funding from the NZTA too. 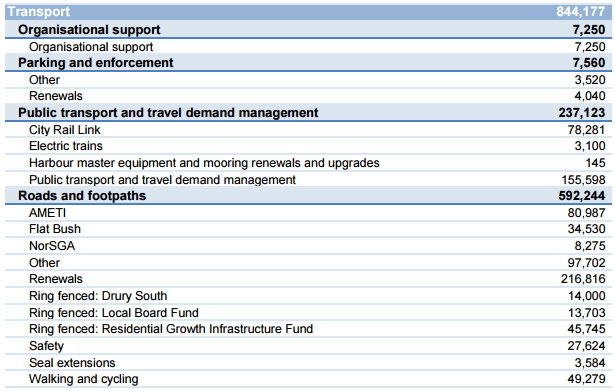 The report also shows this table on operating expenditure across the council family. The budget also presents an interesting counterpoint to some of the argument that’s been raging between the Council and the Government recently. The government have criticised the council for not doing enough to cover their share of the funding shortfall identified in ATAP and as such we haven’t seen any movement from the government on it. This budget suggests the council have gone some way to addressing their side of the ledger so we await with interest the government’s response, and money. Language is vital. One of Len Brown’s underrated mistakes was changing terminology from “plan” to “budget.” Why does it matter? I disagree. To me “plan” sounds like some maybe someday waffle. How many rail plans and housing plans and whatever plans are there sitting in the council archives that have never left the shelf? “Budget” implies tested, funded and happening. How much should Auckland spend on transport? You can’t just have a rule of thumb, you can’t celebrate more spend on public transport in and of itself, what you need to understand is the goal (level of service) people want and are willing to pay for. If my builder came to me and said “J-Deezy, I will charge you $10,000 for building works. Last year it was $8,000, so clearly this year is better” I’d say “… what am I getting?’ Same here. No. Plan sounds uncertain; we plan to do this. Budget is real; we are funding this. Also all politicians say they plan to do all sorts of things and the only time we get to see if they mean it is what things they fund: their budgets are the only time we know for certain they’re being sincere. Also AC has a lot of plans, like the Auckland Plan, and that doesn’t contain actual funds, so is a very different thing. It is important to differentiate between these two kinds of council documents. The Auckland Plan *should* have $$$. A strategic plan without $$ is stupid. A budget is a plan that matters. Councils have dozens of other plans: long term; strategic, Local board, Unitary, traffic management, Auckland; area; City Centre Master; Gulf Marine spatial. The list goes on and on. They are the type of plans that only matter when the council wants them to and get ignored when the Council finds them inconvenient. The budget binds them. Let’s stick with budget. But the problem is the budget doesn’t actually specify what we are getting for our money. 80m for AMETI in 2017. What would that be spent on, land purchases I’d assume ? If it is land purchase, just think: how far that would go towards buying up land for redevelopment into high density on good PT routes? Can sell after development and use the money again and again. I can see the logic in not wanting to compulsorily acquire someones home only to replace it with a home for someone else. I agree. I think the only place I’d go with compulsory purchasing for housing would be perhaps retail, industrial… caryards along arterial routes that could become 3 levels of housing above 1 level of retail / light industry. Agree, I feel sorry for anyone who has to leave their home when they don’t want to. In saying that I think waterview was done reasonably well. I think NZTA and it’s predecessors had been buying property there for 40 odd years so the majority of houses demolished were actually NZTA rentals (presumably leased to Housing NZ). It had also been on the plans for a long time so wasn’t a bolt from the blue. I personally think we should be going further and compensating people who live close to these roads who lose value due to noise etc. This year, perhaps, when they send us the rates bill, could they put a picture of a congested arterial route next to “Transport” instead of the picture of the train? Yeah I love it how they always put pictures of trains and buses next to any road transport spending. Even the east west link from memory. They know what people want them to spend money on, but they still prefer to spend it on roads. That’s a 22% to 78% split. Council spends over 3.5 times as much on roads as it does on public transport. Throw government into the mix and the ratio is far worse. Wish these numbers were picked up by the media. Here’s how it goes. All roads, except state highways, are funded around 45% from road user charges. The other 55% from property taxes (rates). Public transport operations are funded ~50% from fares, 25% from road user charges, and 25% from rates. The reason for the transfer from road users is that they are indirect beneficiaries of PT use; all those people on buses, trains, and ferries, are enabling driving to function at all, by using the alternative. Rate payers contribute because the local economy would be much worse off with the PT user too, land value being a proxy for urban economic performance. This is all about trying to find a financial way to express economic value. It is imperfect. Though probably the greatest misallocation is not the transfer from road users to PT services, but from private motorists to heavy vehicle users, because heavy vehicles cause almost all of the damage to road assets. Also picture the poor non-driving ratepayer, funding all those roads… Note too that rates cover 100% of footpaths. This system could certainly do with improvements. A carbon tax would be good to capture that externality, and of course time variable road pricing, so a more direct relationship between the costs imposed on others by driving choices is in play. You are quite right of course. The point that I should have made was that PT has 3 sources of funding, Fares, Council rates , central government. Thats a bit more complicated by the councils share varies as the half price students are paid for by Council and pensioner fares are paid by central government. Local Roads of course are funded by rates and central government and for new housing subdivisions roads by the developer. Councils spend a lot more than that on public transport for things such as Water and sewage, paying off loans and so on. Its natural that the roading network would require more funding, as its more extensive and without road access a piece of property would be practically worthless – really only useful for farming or to a neighbour who does have acess. Whats the point of keeping on saying ‘should have been decades ago’- Hindsight is always perfect vision. Electrification of the network had to happen first and new trains couldn’t happen till electrification was complete. so another $7 mill is being spent on enabling works for skypath. Assume this is 100% tax payer money and not included in the original budgets for the PPP proposal for skypath. They didn’t tell anybody this when everyone was voting for it. Not shocking at all, renewing the footpaths around the harbour bridge for this extremely popular project is a core council responsibility. So I count $62m there for over 10km of cycleways. Then we get the skypath too. sounds good to me. I assume you have the same issue with Council spending money on upgrading roads that connect to NZTA motorways? I can assure you they spend well more than $7 million on that. Exactly. Arterial Road maintenance costs 1% to 2% of the capital cost every year. Footpaths are cheap to maintain in comparison. If you want to be shocked ask NZTA how much it will cost to operate and maintain the Waterview tunnel every year. According to the herald, “Auckland public transport third most expensive internationally”. Maybe they should address that in their budget? The thing to address is the silly farebox recovery requirement. Wrong measure if the success of public transport is the desired outcome. Considering basic management, it’s well known that when a target or KPI is set, those whose job it is to meet the KPI will (assuming a dis-benefit in the case of failure) try very hard to meet the KPI – Even if they can only do so by gaming the system. In the case of AT, they can game with how they set the zone charges but not much else. No matter how they do that, somebody will be unhappy. Speaking as a public transport user and a private vehicle user, I find public transport to be only fractionally more expensive than my fuel efficient vehicle (*1) and if I were faced with the prospect of having to pay for a park (or travelling at rush hour), I have a *very* strong preference for public transport. So whilst a study with an undisclosed methodology slagged the price of transport, my personal experience is to the contrary. *1: Argument is before looking at associated costs, like vehicle servicing, WoF, insurance, etc as these costs would be incurred regardless – as sometimes I need to use a car. So the impetus for Travel Demand Management is to reduce the carbon emissions from our car-based transport system. The solutions will include public transport. I think it should be lumped with the transport that causes the problem (roads), not the transport that helps solve it (public transport). But maybe it’s only a small sum anyway. I cant find that on ATs website. More disturbing is Sandringham Rd buses will no longer travel via St Lukes, amoung other cut backs on this main route. Travel demand management – hopefully that is the start of work on developing the road pricing solution.